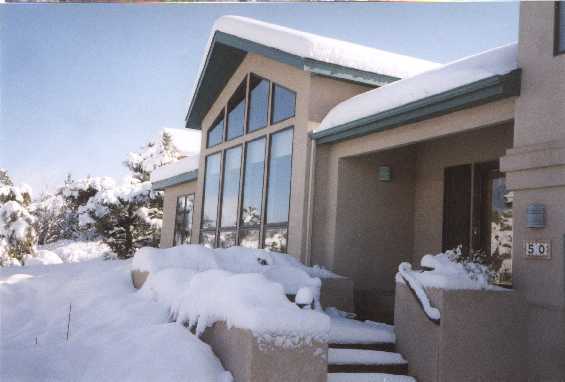 After my retirement and our move to New Mexico (our house is pictured) , Mary Lou and I formed a consulting company, and I continued working part time for a few years. Since we lived at 7,000 feet elevation on the east slope of Sandia Mountain, there were ample opportunities to hike and snowshoe. Here is a scrolling panoramic view of our home and neighborhood (java required), looking down into our valley from the west. Almost immediately I took training to become an interpreter at Rio Grande Nature Center in Albuquerque. Most Wednesday mornings I was able to lead a nature hike for elementary school students, usually in groups of a dozen or so, with their teachers. Initially, as an Easterner, I feared that I did not know enough about the flora and fauna of New Mexico to have any credibility. Quickly, I learned that the children already knew quite a bit from watching TV and merely had to be allowed to discover new things for themselves. The kids especially liked seeing larger furry and slithery creatures. They taught me quite a bit. One day we came across a blue-tailed lizard that was missing most of its tail. Since we had just seen a Greater Roadrunner nearby, and they are adept at catching and eating lizards and snakes, I injected a bit of drama into the experience. “Who is this lizard’s greatest enemy,” I asked. Expecting them to name the bird, I was surprised when one boy said “Humans are, because we take away the land that they need to live on.” It was certainly a humbling experience. We often had groups of Indian children bused in from neighboring Pueblos take part in the walks. One day, we came upon a Western Screech Owl, sitting lazily at the entrance of a hole in a Cottonwood. The children acted fearful around the owl, which actually had its eyes closed and seemed oblivious to our group. Their teacher explained that there were some traditions regarded the sighting of an owl as an ill omen. By squeaking and imitating it call, I tried to get the owl to open its eyes, to no avail. Suddenly a police siren erupted from somewhere, and the owl’s eyes opened widely. The children whooped with glee. Their teacher later sent me drawings they made after their experience, and almost all had pictures of owls with big yellow eyes! My experience as a nature interpreter at Rio Grande Nature Center led me to write a little story for our grandchildren about a cottonwood tree. 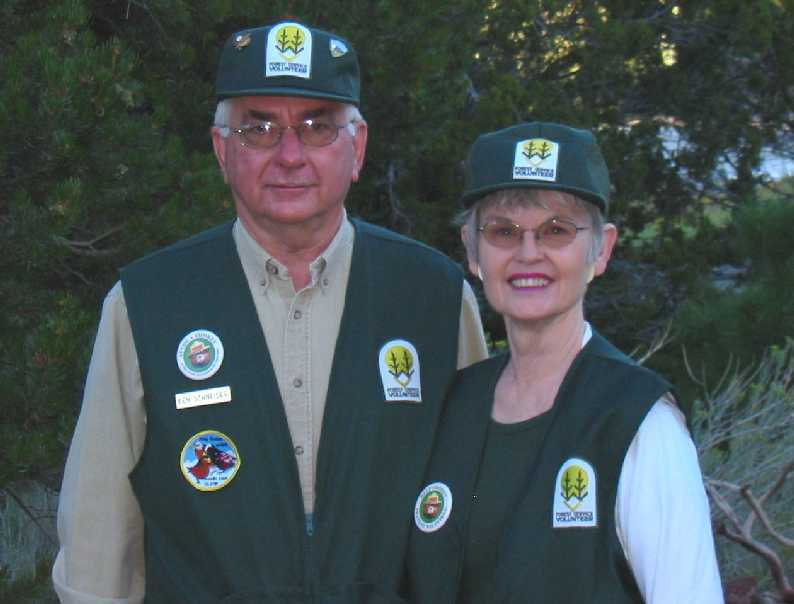 Mary Lou and I also volunteered with the US Forest Service Sandia Ranger District. After completing the training as “Wilderness Information Specialists” we were issued uniform caps and vests. Our “job” was to patrol the various trails, providing information and sometimes picking up trash or reporting vandalism or other problems we might encounter. During fire season we had to be on the alert for smoke and also help enforce restrictions. Since we were often out on the same trails looking for birds and other wildlife, this did not pose much of a burden. This newspaper photo shows us closing a trail during a fire emergency. We led weekly bird hikes for the public at elevations up to 10,600 feet, and also got very involved in a bird feeding project that attracted three uncommon species of rosy-finches to become regular winter visitors to Sandia Crest. This article in Birders World describes the project in more detail.